Echelons! Was ever there a finer spanner flung gleefully into the works of a predictable bike race? Crosswinds are always fun. When a race splits into pieces on flat roads, all bets are off. It happened in 2013 and it was magical. This year, the insanity wasn’t quite so prolonged, but it was every bit as demented. Rob Hayles’ reaction was pretty much on the money. When the split came, it saw four riders detach themselves from the peloton. Those four riders were Chris Froome in the yellow jersey, Peter Sagan in the green jersey, Froome’s team-mate Geraint Thomas and Sagan’s team-mate Maciej Bodnar. All four had a perfectly decent reason to ride as hard as they bloody well could. So they did. “Sagan was motoring,” said Thomas afterwards, which is pretty impressive considering his efforts yesterday. If the previous stage had showcased the Slovak’s mindlessness, today shone a light on his genius. Sagan won the sprint, as he was always going to. Froome did actually try to beat him – which was pretty game of him – but Sagan just glanced sideways and calmly ratcheted up the power. He didn’t even break a sweat. Froome won’t exactly be heartbroken with second on a sprint day though. He took six seconds plus a six second time bonus on all of his rivals. Joaquim Rodriguez lost over a minute and drops out of the top ten. Bastille Day. Summit finish. Mont Ventoux. It’s all going to go off. Except it might not because 100kph winds are forecast for the top, so they might cut the stage short. If not, Mont Ventoux is 15.7km at an average gradient of 8.8%. Oof. Delicacies of this region include mashed potato and cod, bull stew, various famous provencal foodstuffs and also pieds-paquets – “stuffed mutton feet and guts with tomato sauce”. It’s a shame that the wind is going to rob us of the spectacle of a HC climb. 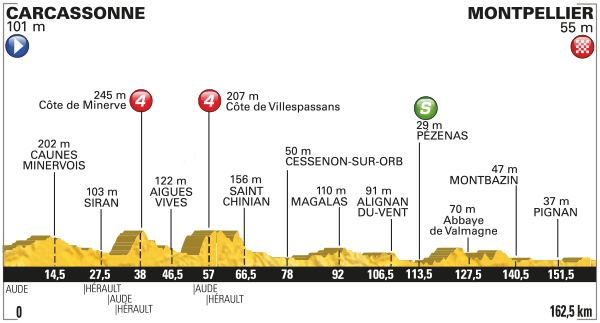 It probably also makes it that bit easier for Froome to hold the yellow all the way into Paris, although whether any terrain would offer a chance for Quintana to get ahead if him is debatable. It is a shame, but at the same time a shorter climb means higher intensity. 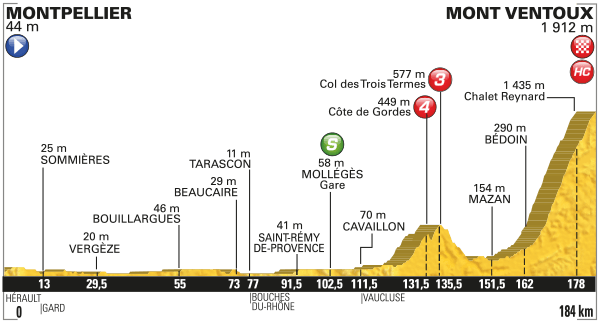 It remains a summit finish and it’s still plenty long and steep enough to separate the favourites.